Adolfo Betti was an Italian violinist, teacher, and music editor born (in Bagni Di Lucca, Italy) on March 21, 1875. (Bagni Di Lucca is a small village in Tuscany, Italy - it is situated about 30 miles northwest of Florence and about 70 miles south of Cremona.) 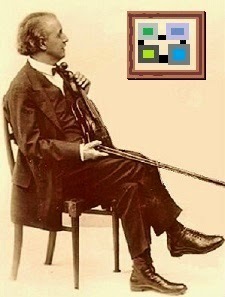 He is known for leading, as first violinist, the Flonzaley Quartet from 1903 to 1929. In its first few years, he and second violinist, Alfred Pochon, actually alternated playing first violin. Two other quartets who used to or still do this are the Emerson and the Jacobsohn string quartets. The Flonzaley quartet was one of two very famous (and important) American string quartets playing in the early twentieth century - the other was the Kneisel Quartet. Interestingly, its founder was not a professional musician. He was philanthropist Edward J. De Coppet. The quartet was actually named for De Coppet’s summer home near Geneva, Switzerland. Although I have no idea who Betti’s early teachers were, I do know he made his public debut as a child of either six or seven - accounts vary. He entered the Liege Conservatory (Belgium) in 1892. There, he studied with Cesar Thomson. He graduated in 1896, at age 21. Thereafter, he concertized in Europe. In 1900, he was appointed assistant to his former teacher (Thomson) at the Brussels Conservatory. In 1903, he was invited, by Alfred Pochon, to become part of the Flonzaley Quartet. Pochon was also teaching at the Brussels Conservatory at the time. Betti was 28 years old. After the quartet disbanded, Betti spent his time between New York and his birthplace, teaching, editing music, and playing occasionally. The public library in Bagni Di Lucca is named after him. According to one source, he was even mayor of Bagni Di Lucca for a while. In New York, Betti taught at the Mannes College of Music. He played, among other violins, a 1782 J.B. Guadagnini and a 1741 Guarnerius Del Gesu. I don’t know who owns or plays those violins today. One of his better known students was David Nadien, who very recently passed away. Betti died on December 2, 1950, at age 75.